People are responsible for starting and ending (violent) conflicts. This means that influencing actors involved in conflicts is the only way to come to a cessation of hostilities and a solution to a conflict. This can no longer just be done by the military and only on the “battlefield”. Conflicts and conflict environments have become too complex and interconnected in a globalized world. 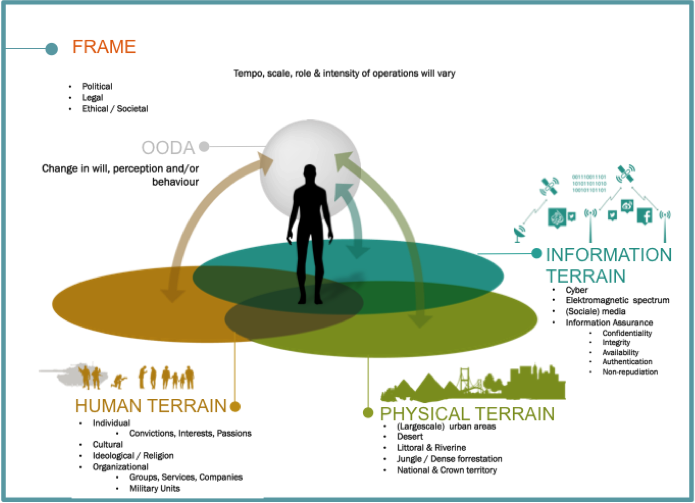 Bearing this in mind, the Royal Netherlands Army Land Warfare Centre (RNLA LWC) developed a three-landscape concept that consists of the human, information and physical landscapes. The concept’s main focus is to connect activities in the three landscapes to influence actors and populations, using a comprehensive approach by a network with a variety of partners including the military. The information landscape offers an array of possibilities to not only influence actors in conflict but also diasporas and involved civilians, like you and me, all over the world to either support or oppose certain conflict actors. The RNLA LWC defines fighting as changing the behaviour of an opponent by influencing their OODA loop if necessary with the use of force (Boyd, cycle of observe-orient-decide-act) . Traditionally armed forces specialize in disabling the opponent’s means of action in the physical landscape, by using force against an opponent’s sanctuaries and weapon systems. Nowadays in the age of hyper connectivity armed forces are more and more active in the information landscape. Information superiority has become a precondition for protecting their own internet-connected material and morale, gathering information on opponents and their supporters and even attacking the opponent with non-kinetic means. These non-kinetic actions are focussed on an opponent’s financial resources, and means of communicating their narrative and control. Disabling an opponent’s capability to act, however, becomes very difficult in a globalized world. A more effective approach is to influence the orientation phase of an opponent’s decision cycle. In this orientation phase, armed forces must influence the perception of an opponent and their supporters. To do this successfully it is essential to have a profound understanding of the opponent’s identity, emotions, interests and networks. The network of individual, cultural, ideological and organizational links is called the human landscape. Conflicts can be mitigated in a lukewarm phase when a potential opponent’s behaviour is influenced successfully in the human landscape. So what is the relevance for globally connected citizens? New technology such as social media, commercial unmanned vehicles (including Drones) and a globalized market do empower the crowd. The crowd today has become a very powerful actor who can actually stop and/or fuel a conflict. In phase one, available reliable footage is selected and pushed on social media. The crowd is requested to provide information on who is involved in the chain. In the second phase information received from the crowd on institutions and persons who actively play a role in facilitating the war crimes are analysed to reconstruct the chain. In phase three names of those who are (partly) responsible will be published worldwide. In the fourth phase it is up to the crowd to deny financing and support to organizations facilitating these atrocities or simply become a part of the chain themselves by doing nothing. This four phase could effectively prevent the regime from receiving essential things like spare parts, specialized personnel or financing, and force a stop to their actions as a result. Most likely the majority of those involved in the chain will not be aware of the role they play in the chain. Personalizing war crimes and attributing them to responsible ideological groups, institutions and organizations will change the human landscape and pressure people to leave (and break) the chain. Becoming active and enhancing awareness of the second and third order effects of the groups, institutions and organizations you support, helps make the world more transparent and, as a result, warn others of the consequences of supporting destabilizing groups. LtCol Arjan van Daalen works in the Trends&Concepts desk of the Land-warfare Centre within the Royal Netherlands Army. The Trends&Concepts desk studies global trends, deduces conclusions for land-operations and develops future forces. This article is a reflection of a presentation delivered by LtCol A.F. van Daalen at the #HackingConflict #DiploHack Challenge in Ottowa, Canada in May 2015. LtCol A.F. 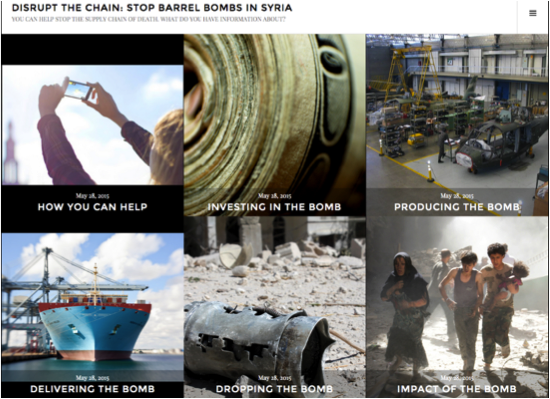 van Daalen was part of Team B, which won the #HackingConflict Judges Award.